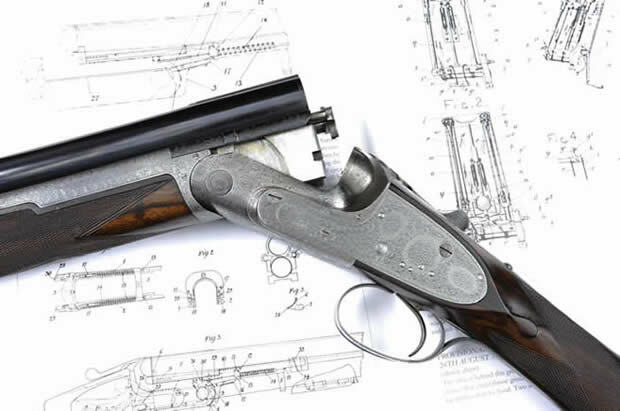 Offering Fine Modern and Vintage Sporting Guns, Rifles and shooting accessories, dating from 1860 to the present day, Gavin Gardiner Limited, in association with Sotheby’s, offers items by the best British and European makers. From the earliest breech loading hammer guns dating from the 1860s to the finest hammerless game guns of the Edwardian era through to the present day. Shooting accessories, gunmaking tools, place finders, cases and cartridge magazines are always popular with collectors and add to the diverse selection of items that we deal with. Guns from the famous London makers including James Purdey & Sons, Holland and Holland, Boss & Co. as well as the best of the provincial makers are all represented in our sales. With items for the sportsman and collector alike, we offer everything for the shooting field. Holding two London sales each year at Sotheby’s West London salerooms, as well as running Sotheby’s renowned annual auction at the Gleneagles Hotel in Perthshire, Scotland every August, Gavin Gardiner Limited is able to place your property in the most suitable sale and achieve the highest prices at auction. We offer free and confidential advice on all aspects of buying and selling Sporting guns and our knowledge of the market and contacts within the gun trade place us in a unique position. 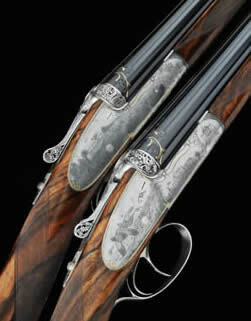 Numerous record prices have been achieved and highlights have included a World Record price of £80,450 achieved for a 12-bore over and under sidelock ejector gun by Boss & Co. and a superb £79,250 for a magnificent pair of Exhibition quality Keith Thomas engraved 28-bore sidelock ejector guns by Watson Bros. The Eric Clapton collection of Boss & Co shotguns included many over and unders from this iconic maker and we also were responsible for the discovery and sale of the rarest Boss of them all, the prototype over and under from 1909. With the only fully illustrated auction catalogue in the business, as well as a fully searchable online catalogue we are able to reach buyers worldwide and offer a personal level of service that is second to none. With over thirtyy years experience with Sotheby’s, Gavin Gardiner is delighted to have the opportunity to continue his association with the World’s Leading Auction House while developing his position within the Worldwide market for fine Sporting Guns and Rifles. 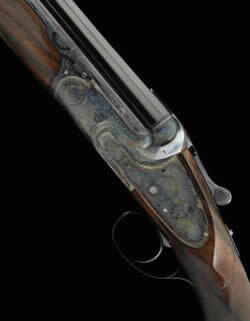 The Prototype Boss & Co" Over and Under" 12-bore single trigger sidelock ejector over and under gun.